← Why Weave on a Winter Solstice? I just finished my first weaving of 2014! A year ago I was preparing to go and live in Australia for ten months. A lot happened in 2013; some of it good and some of it sad, but Western Australia captured my heart, and helped me see the world through a different lens. Certainly the colours of Australia captivate – so bright and sparkling, with reds and oranges and colours of the earth predominating. I wanted to weave something that I could hang on my wall, and that would make me smile and transport me back to a place I was happy to call my second home. This is a woven interpretation of the iconic “Stairway to the Moon”, much photographed, near Broome, Western Australia. I am an Aries, a “Fire Sign”, but water always calms me. To see the sun or the moon reflected in the water fills me with both joy and wonder – such magnificent forces in the universe that came together to create this wonderful earth on which we live. This, then, is my interpretation of the full moon rising over the horizon, big and bold, and reflecting in the tidal flats. It truly is a wonderful world. The image is derived from photographic images of the Stairway to the Moon; Google “Stairway to the moon” to see some brilliant examples. I wanted to experiment with using knitting yarns in my weaving, particularly sock yarns and yarns with long colour changes. The yarns I chose to experiment with are Trekking XXL sock yarn in a very subtle colour change variegation of navy, midnight blue and indigo purple, which I used for the sky and the water in shadows. 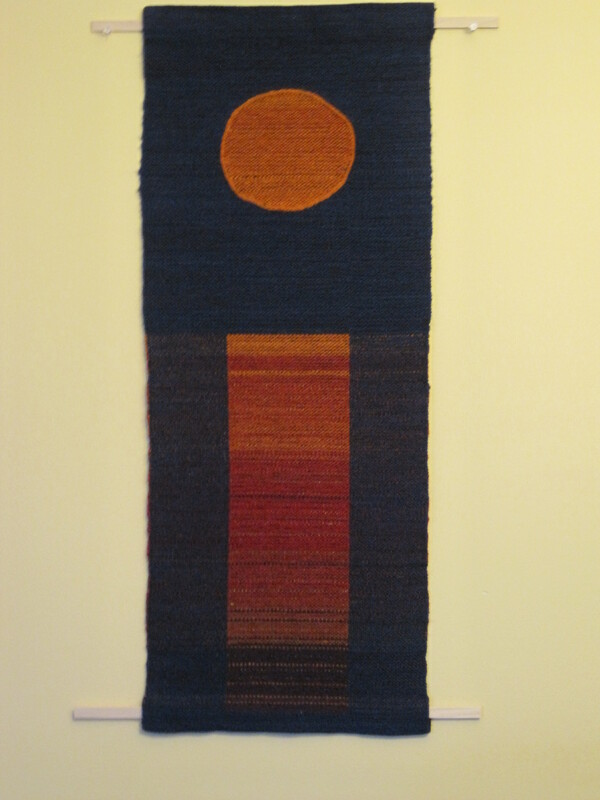 For the moon and the reflection, I used Kauni wool from Denmark, which is sold locally. It has very long and blended colour changes, which I manipulated to get to the colours exactly where I wanted. I started with purples at the bottom, moving up through the reds and finishing with the oranges. 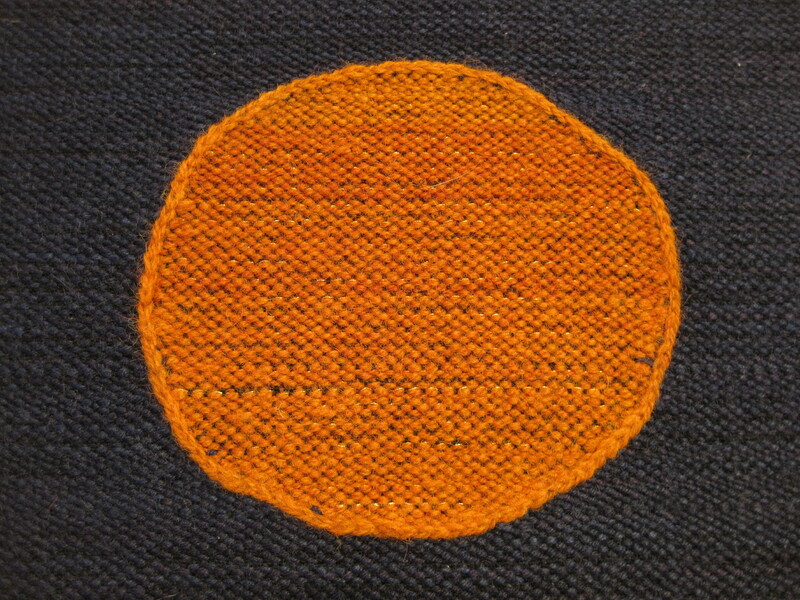 The moon is inlaid in the weaving, and finished with a chain stitch circumference. The weave structure is a very simple two-block Summer and Winter, used without tabby (on opposites), Block A on the edges, and Block B for the moon and its reflection. Two shuttles were used for each row, blue for the water and sky, and variegated for the moon and the reflection. I added a very fine gold metallic randomly, on top of the variegated yarns to represent the sparkle of the moon on the water. The moon is finished with chain stitch around the circumference. The warp was set 14 inches in the reed, and woven to 36 inches long. The finished hanging is 12 inches wide by 32 inches long. This entry was posted in Uncategorized, Weaving and tagged Broome, Summer and Winter, Weaving, Western Australia. Bookmark the permalink. 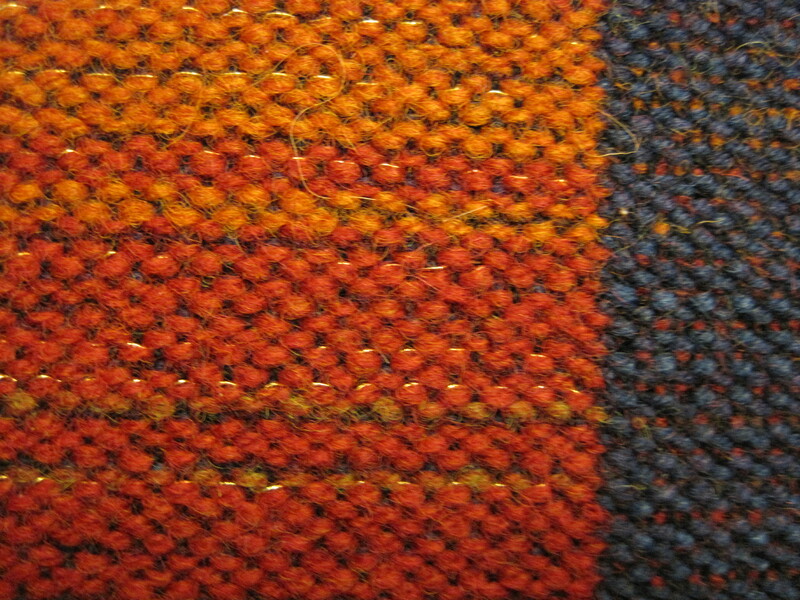 2 Responses to First Weaving of 2014 Completed! Great piece Barb, I love the description of what it means to you. I think you would be a great teacher! Still time to take it on. Thanks, Vicki. I will be teaching a weaving workshop at Place des Arts in May.